BDC Laboratories’ innovative HDT-500 heart valve pulse duplicator test system achieves ISO 5840 pulsatile testing requirements in a focused, efficient, and user friendly manner for both surgically implanted and transcatheter aortic and mitral heart valves. The HDT-500 can easily be configured either as a left heart simulator or right heart simulator. 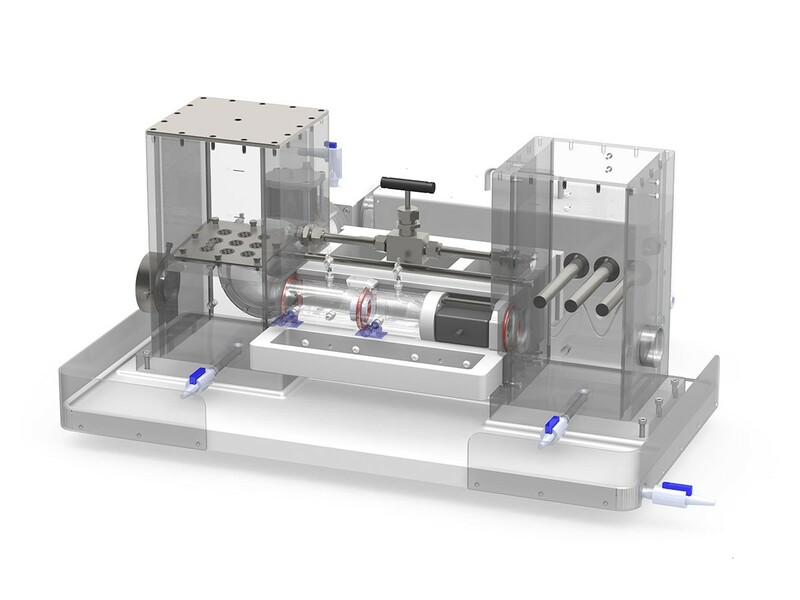 Using a novel drawer-style fixture assembly, there is no need to drain the system between tests and changing the test article occurs in minutes to significantly increase productivity. BDC’s proven PD-1100 pulsatile pump is the fluid driving source for the HDT-500 pulse duplicator system yielding high beat-to-beat repeatability and dynamic configurability. Optical visualization ports on both the inflow and outflow of the test valve allows for visualization from either orientation. The accompanying Statys® HDT control and monitoring software gives the user absolute control over the pulse duplicator excitation waveform. The real-time data collection and analysis tools impeded in the software provide instantaneous measurement the device parameters, such as pressure drop, effective orifice area, regurgitant volumes, and leakage rates. valve deployment in the system. clinically relevant flow waveforms and pressure profiles for cardiac valve testing. The HFE consists of an impedance element and compliance chambers. Low Pressure Valve Module, LPV: The LPV consists of specific HDT-500 system elements for low pressure applications such as pulmonary valves, tricuspid valves, and venous valves. Automated Drawer Activation, ADA: The ADA system allows the user to automatically open and close the Valve Exchange Drawer. This option is particularly useful when testing a large number of valves on a regular basis. Large Valve Drawer: The HDT-500 can evaluate a sample up to 65 mm in size. A Large Valve drawer is available for mounting valve samples up to 80 mm. Extra-Large Valve Drawer: The HDT-500 can evaluate a sample up to 65 mm in size. An Extra-Large Valve drawer is available for mounting valve samples up to 95 mm.